I’m going to keep this one short because there’s more coming down the road about Barona Creek, but I wanted to at least throw this up to introduce Barona to those of you who haven’t played it or aren’t familiar. Barona is a casino/resort course located in northeast San Diego County amongst the San Diego foothills in Lakeside. Locals know Barona well and know why it rates so highly amongst California courses, but my sense is that it has a bit lower profile regionally and nationally than, say, the coast courses in that the golf friends I’ve told about Barona haven’t been familiar. That’s a shame because, among other things, Barona shows what great diversity there is amongst California golf experiences – something I think people wildly underestimate about the state– and this would be one of the first places I would recommend. Barona is a creature of its remote environment, providing a solitary golf experience in a prairie/desert landscape dotted by oak trees. Barona is particularly known for the high quality of its greens, and there in also lies the challenge. You’re putting on a rollercoaster when you play Barona and you better be able to control your speed or you’re in for a long, bumpy ride. Anyway, there are plenty of holes to highlight at Barona but I’m singling out No. 9 this time because it visually gives you most of the dominant elements at Barona – mountains, prairie grass, water, desert scape, very natural-looking and expansive bunkers and the resort itself. No. 9 is a par-4 that plays 383 from the golds and 408 from the tips. It’s classic Barona in that there’s not much intimidating here visually and very little of what trouble you do see should come into play – including the creek crossing in front of the green – so a driver/short iron/two-putt par seems plausible. Yet if you get complacent or careless with the approach or a putt, you’ll wind up finding extra strokes on your card. If you look at the green view, you’ll notice what you’re in for if you hit your approach and end up above the hole here. I speak from experience when I say that’s a quick one. 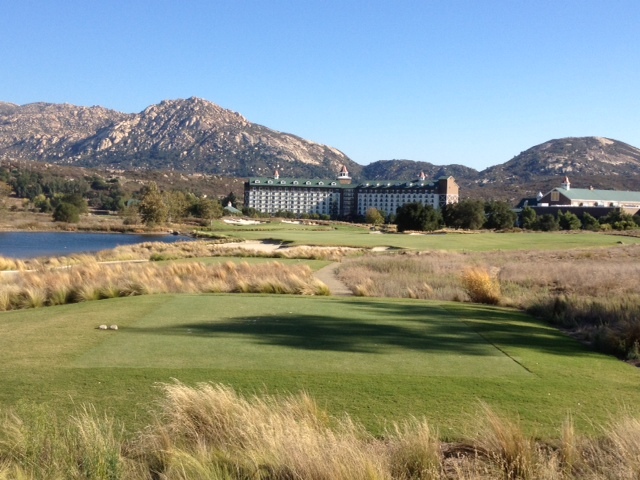 Pin placements can turn birdies into bogeys or worse at Barona. It’s that kind of course. But that challenge is part of what keeps from my friends coming back here. 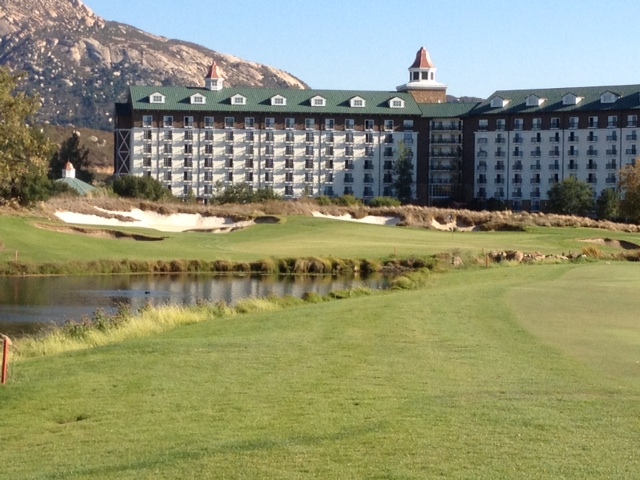 The margin at Barona between a great round and feeling like one got away can be very slight. I’ve played here twice and truly felt like I had one of each. I look forward to the rematch and some revised strategies for a course that has a way of drawing you back, enticing you with the promise of that round to remember on an unforgettable golf course. This entry was tagged Barona Creek, Golf Day Trip. Bookmark the permalink.